I am not too-much-of travel person. I like exploring new places if-and-only-if I am in company of people whom I am comfortable with and everything related to trip is well thought of. It was four day long easter getaway. We (my husband and me) planned to go to Copenhagen and Prague. I must say, Copenhagen is a beautiful city. Quite and Peaceful just like I heard of. We took a late night flight and reached around 1 in night on Friday. There are early sights of Spring but Copenhagen was cold. We pre-booked the hotel through hotels.com. You can save some money if you book hotels through this website in advance. We took a cab from Airport to hotel. 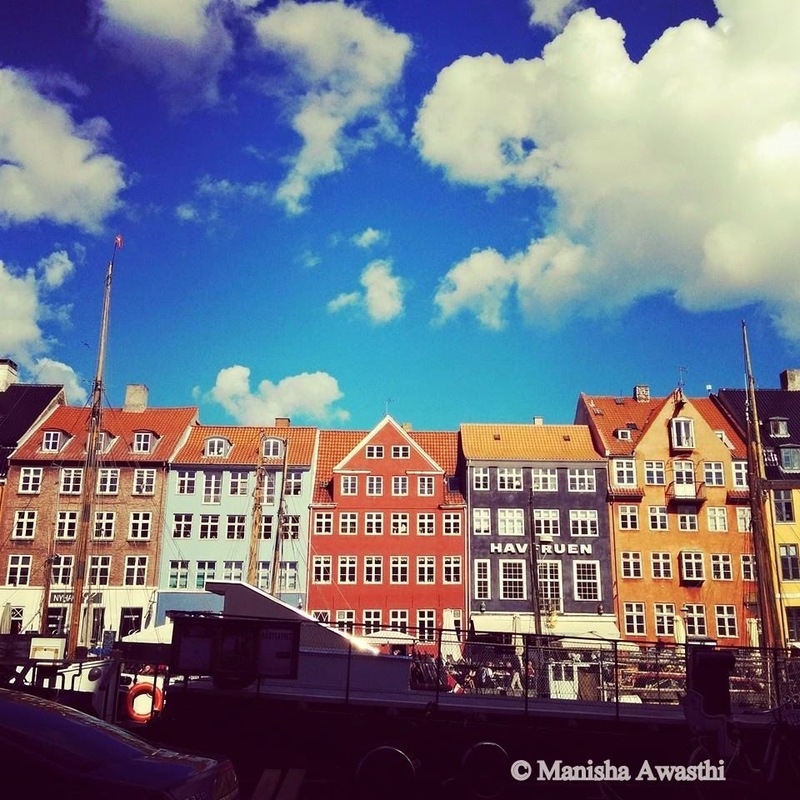 In morning, we went to view beautiful coloured houses in Nyhavn. It creates a beautiful view and you can also get hop on – hop off tickets of cruise tour from here. Next in the list was Tivoli Gardens. It’s an amusement park with wild rides. You can take a cab to Tivoli or public transport can be used. We bought a public transport ticket (valid for metro and bus both) from our nearest metro station. Just keep in mind that ticket vending machines do not accept notes. You can only use card or coins to buy tickets. 24 hour daily pass for all zones cost us around 110 DKK per head. We had one change for Tivoli. It depends from where you are starting your journey. It was a 10 mins walk from where the bus dropped us. And we reached Tivoli Gardens with all the excitement. The entry ticket to garden itself is 99 DKK and a multi ride ticket is 209 DKK. They make you wear a wrist band if you buy multi ride ticket. There is option to buy tickets online but you can buy tickets there also. There was no wait time in queue. It was a sunny day with a 2 minutes drizzle in between. Tivoli is beautiful in daylight and it’s mesmerising in moonlight. We started our day with The Demon. It will give you a chill in its twirls and speed. Next was The Golden Tower. Free fall from 63 meters will give you goosebumps. After that we sat in the most thrilling ride – Vertigo. Upside down, Circular,swirl – all motions in one ride. You can feel the force of wind. After some time, you will stop screaming, it has that much of force. Next was The Roller Coster. It is one of the oldest running wooden roller coasters in the world. Few bumps and drops are amazing. After that we experienced the height with The Star Flyer. You get complete view of Copenhagen from this ride. Well, I was little scared at the top but the view was worth it. Other rides like Spinning top and Aquila will give you small moments of spine chill. There are many rides for kids as well. Below is a pic of star flyer in action. As the sun was setting, entire garden started gleaming with colorful lights of all sizes and shapes. The decoration was looking like fairy land. There are many restaurants inside Tivoli itself serving delicious food. We were hell tired at the end of day and it was already time to go to our next destination with such wonderful memories.